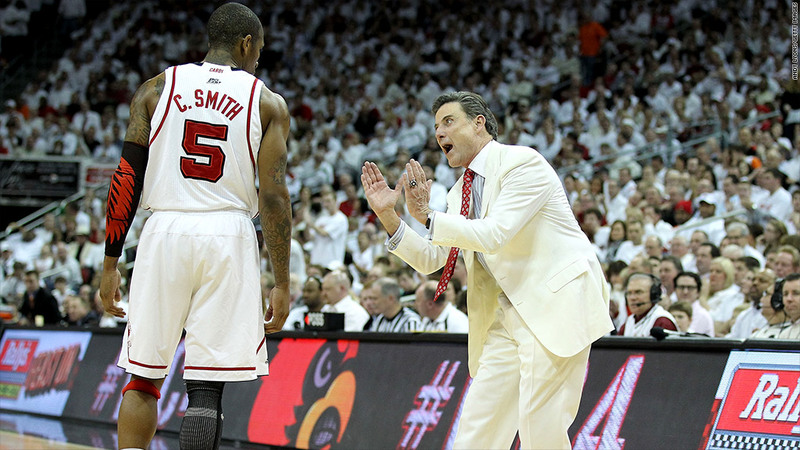 Louisville basketball coach Rick Pitino doesn't have much to be unhappy about. His school is the top ranked in the NCAA tournament, as well as in profits and revenue. The University of Louisville heads into the NCAA tournament at the top of the rankings in more ways than one. It's the college basketball king of revenue and profits. The school, which also has the No. 1 ranking in the March Madness tournament, earned a profit of $26.9 million from its men's basketball program last year, according to figures that schools have to file with the Department of Education and analyzed by CNNMoney. That's about 60% more than the $16.9 million profit at the University of North Carolina, whose men's hoops team had the second largest profit. Louisville turned that profit on revenue of $42.4 million. Syracuse came in second with $25.9 million in revenue. Louisville's profit margin is a whopping 63% -- enough to make any NBA owner green with envy. The pros pay just over half of their revenue to the players. But Louisville's profit margin is only the fourth fattest. North Carolina rules on that measure with a 70% margin. The basketball programs at Minnesota and Ohio State also have higher margins than Louisville. Of course, not every school is churning out cash from their basketball teams. Three dozen schools out of the 345 Division 1 programs that reported figures to the DOE posted losses. But all told the Division 1 schools reported a combined profit margin of 25% on $1.3 billion in men's basketball revenue. But Louisville and Syracuse are likely to stay near the top of the basketball revenue rankings next year even as they leave the Big East. That's because they are moving to the ACC, the powerhouse conference that is home to North Carolina and Duke. The conferences also split the football bowl game payouts each year evenly between their members. The chase for dollars has so many schools changing conferences in recent years that keeping track of who's going where has become as difficult as hitting a half-court shot. So even winning the NCAA title is not a guarantee of a financial whirlwind. The University of Kentucky, a member of the SEC and last year's NCAA men's champion, brought home only about half the revenue as its in-state rival Louisville. The SEC, while a football powerhouse, has not done as well in March Madness as some of the other major conferences. So Kentucky finished only 21st in the ranking of the most profitable basketball programs, just behind Big 10 member Northwestern University, which has never made it into the basketball tournament but benefits from the success of other Big 10 schools.